The medieval world is widely recognised as one in which ritualized actions played an important role in religious, social and political life. Liturgical rites constitute an important, yet understudied, part of the medieval record, largely because the study of them has become highly specialised and compartmentalised as different academic disciplines have developed their own approaches to this form of evidence. Liturgical rites pose particular problems for modern scholars because often the only surviving evidence for them is written texts which are very imperfect guides to actual performance. 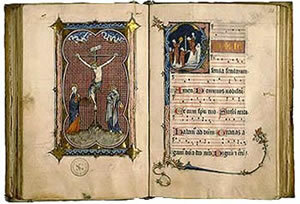 The network will bring together international scholars from a variety of disciplines – history, musicology, theology, English literature, theatre studies, palaeography, art and architectural history – in order to resolve the tensions and to break down the barriers which currently exist to the interdisciplinary study of medieval liturgical rites. The network will focus on the evidence for occasional services (rather than those for the Mass and the Office), that is personal rites such as for baptism, penance, and burial, as well as annual procession, including those for Palm Sunday and the Rogation Days; these were the rituals which lay at the heart of church life for all medieval Christians, lay and clerical. These services structured the course of individuals' lives, but also bound them to the wider community, and helped to articulate community identities.